Abbie Hacker has almost nine years of experience in strengthening relationships and establishing partnerships within the philanthropic community, making her a valuable asset to both The Curtis Group and her clients. As client manager, she helps nonprofits achieve their organizational goals and improve the communities they serve. Prior to joining The Curtis Group, Abbie served as associate director of development and interim director of development & external relations for Tidewater Community College. She has also worked as assistant director of annual giving for Eastern Virginia Medical School and development officer for Operation Smile. 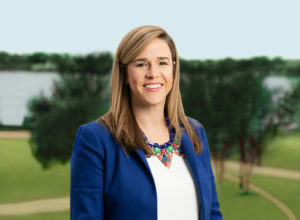 Abbie holds a Bachelor of Science degree in Merchandising Management and Business Leadership from Virginia Tech, and earned her MBA in Public Administration from Old Dominion University. Abbie is a member of the Association of Fundraising Professionals, serving on AFP’s Hampton Roads National Philanthropy Day Committee. She also is a member of the Virginia Tech Hokie Club, the Virginia Tech Pylon Society, the Council for Advancement and Support of Education, and has been a volunteer with Portsmouth Service League. In her very active free time, Abbie loves spending time on or near the water with her husband Matt, son Hodges, and labradoodle Huckleberry.